Funny how things can change. What seemingly were thought to be constants or a permanent transformation can be abruptly reversed either disrupting the pattern resulting in an outcome believed improbable. Take the past two years for example. 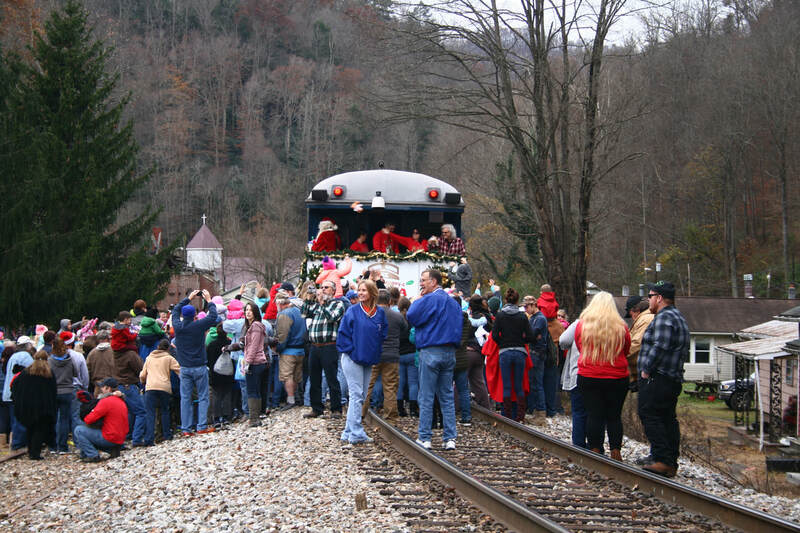 When I wrote of the Santa Train experience in 2015, the former Clinchfield Railroad was a month removed from downgrading as a main line corridor with the elimination of through traffic. 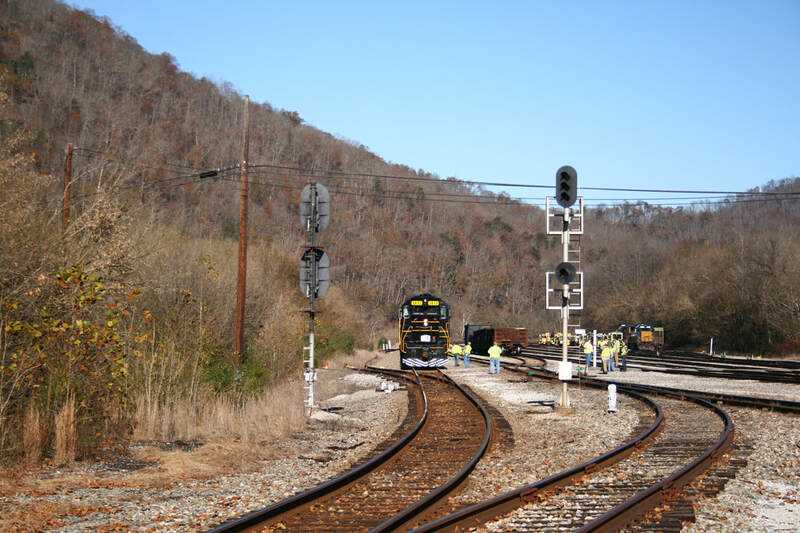 The sector of the railroad between McClure and St. Paul, VA was "mothballed" by CSX----taken out of service on the timetable although sporadic movements continued as well as Norfolk Southern utilizing trackage rights for its coal traffic. A dark cloud loomed over the operation of the Santa Train that year in the aftermath of the downgrade prompting the inevitable question "will this be the final one?" 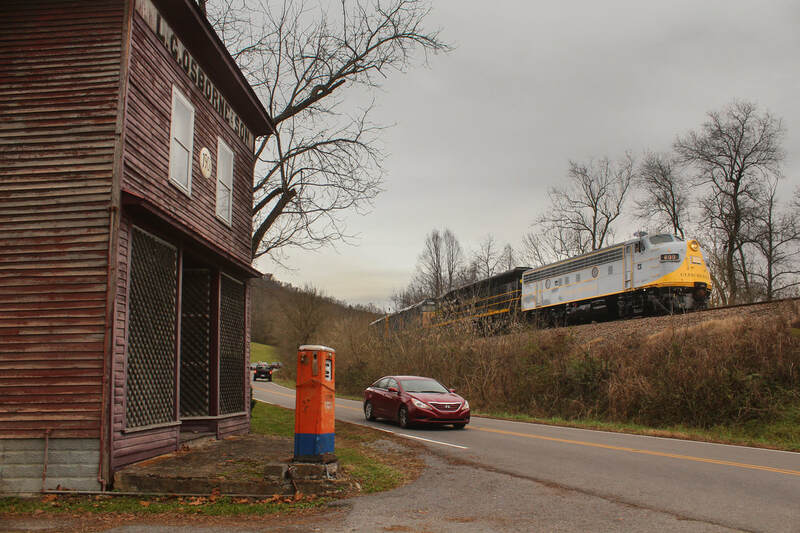 As for CSX itself, the Santa Train has been a notable exception to an otherwise long standing policy of indifference of recognizing its rich predecessor heritage much to the chagrin of the railfan and historical communities. Its anti-steam policy further exacerbated its reputation--the refusal to operate steam locomotives on the Santa Train and excursions such as the annual New River Trains. Expounding this negative image in recent years was Norfolk Southern recognizing its lineage with fleet of locomotives painted in its predecessor colors and the embracing of a steam program by comparison. Fast forward two years to 2017. 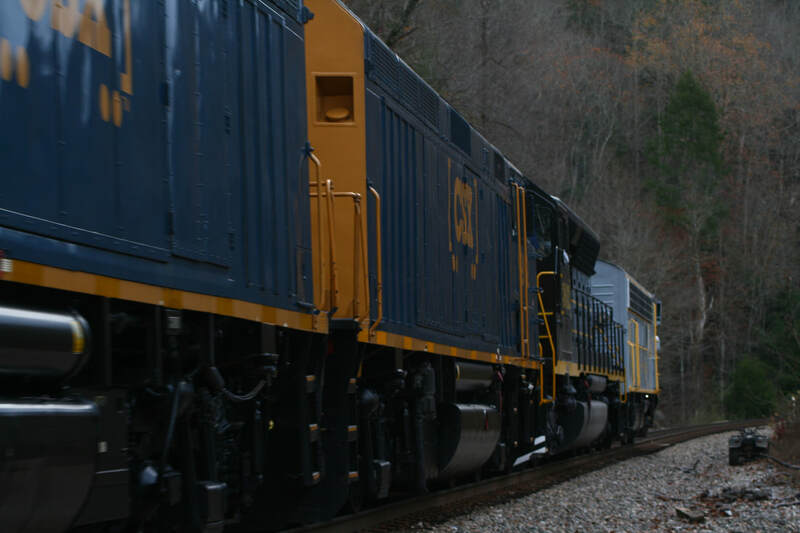 A change in the corporate administration has recognized the value of the strategic corridor that is the former Clinchfield Railroad connecting north and south. The route has been reopened for through manifest traffic and bulk trains but not yet on a large scale. 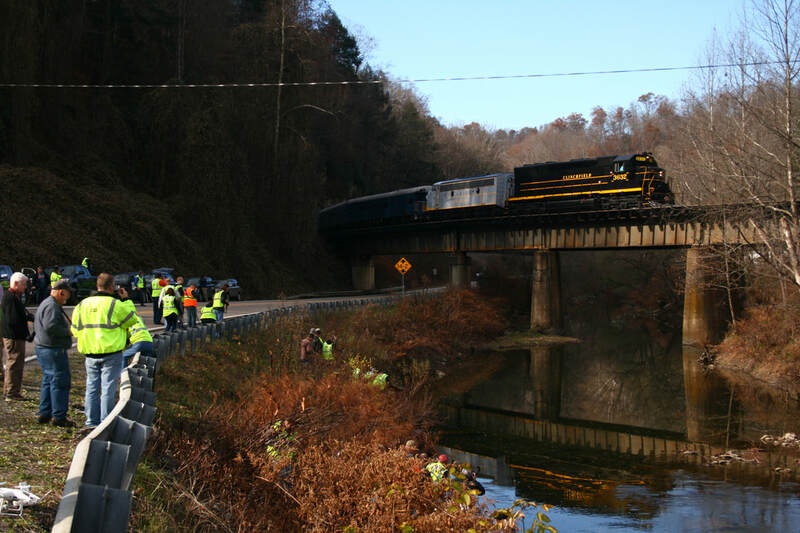 Although the Clinchfield route will never again see the parade of coal train movements that once defined it in the past, it lives again with a potential for additional traffic. As for the duration, that is uncertain at the time of this writing and especially in the tumultuous railroad landscape at present. Changes occur literally overnight with the operations of today. 2017 has also witnessed at least a crack in the shell of historical indifference that has shrouded CSX for more than two decades. Earlier this year, the company acknowledged the "Texas" lineage from the Great Locomotive Chase lore by sponsoring an event at the North Carolina Transportation Museum at Spencer, NC (The event is documented on this web site). It later commissioned the painting of two locomotives at its Huntington Shops in Chessie System and C&O Railway liveries for the Lake Shore Museum and Buckingham Branch Railroad, respectively. And of course, the Huntington Shops also repainted the previous C&O Railway #8016 into Clinchfield colors thereby restoring it to its original appearance for the Southern Appalachian Railway Museum and embracing its use on the Santa Train. In the grand scheme, it is a start. Whether CSX will continue on this path remains to be seen. There is no denying the tremendous potential given its rich predecessor heritage. But to stay in the context of harsh reality, the railroad is facing serious challenges that supersede the realm of heritage and historical events. 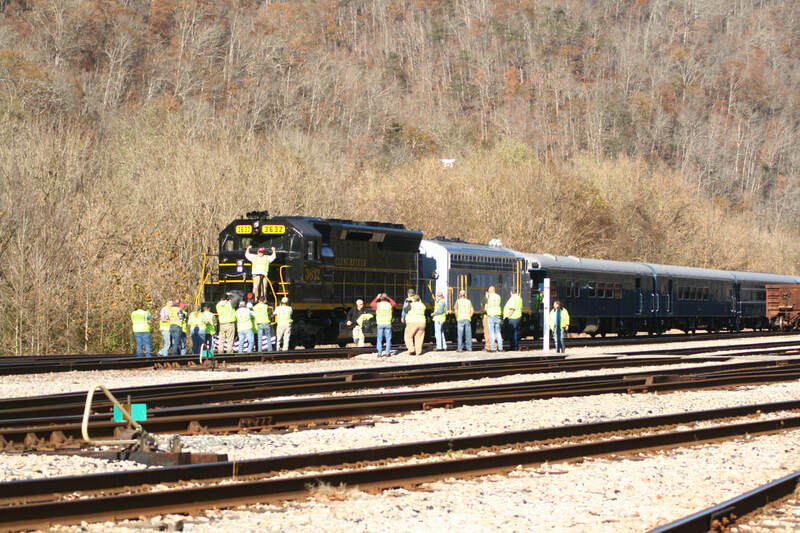 The locomotive that is now the Clinchfield Railroad #800 has come full circle. 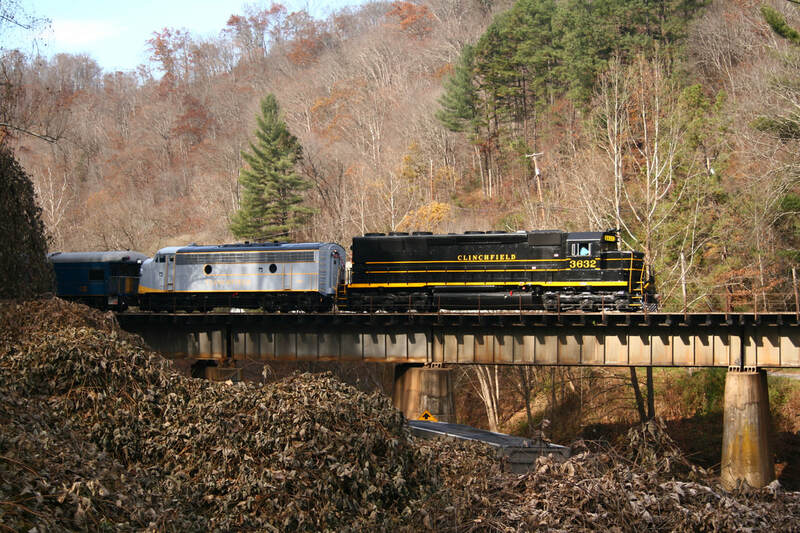 It began service in 1948 as a F3A for the Clinchfield and was ultimately upgraded to F7 specifications in 1957 carrying on for years afterward until retired from revenue service. It later saw use in business train service once the Clinchfield was merged into the Family Lines System and remained on the CSX roster until the early 1990s. 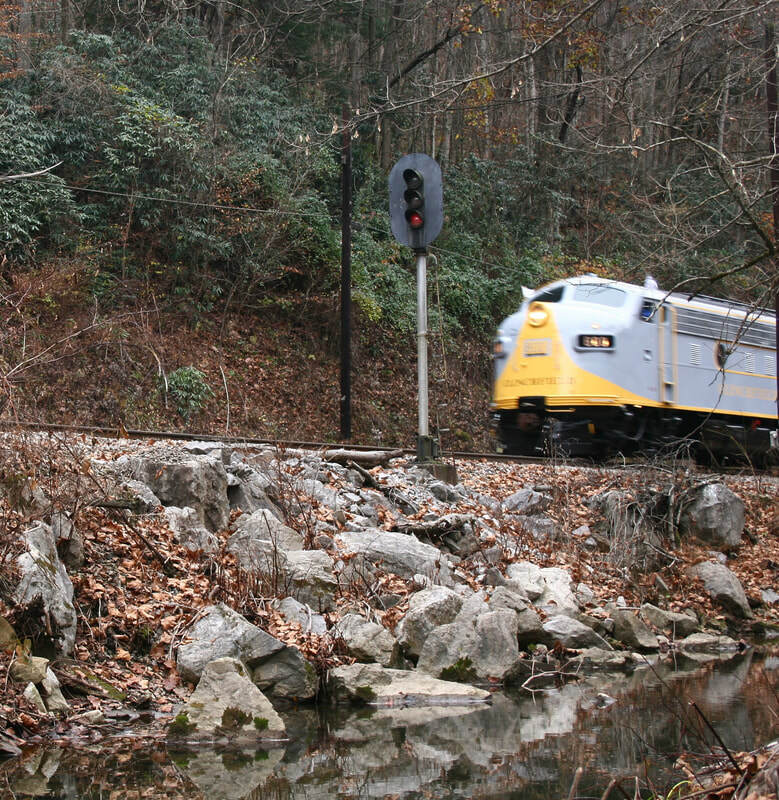 During the CSX era, the locomotive was briefly used in roadrailer service between Detroit and Atlanta. 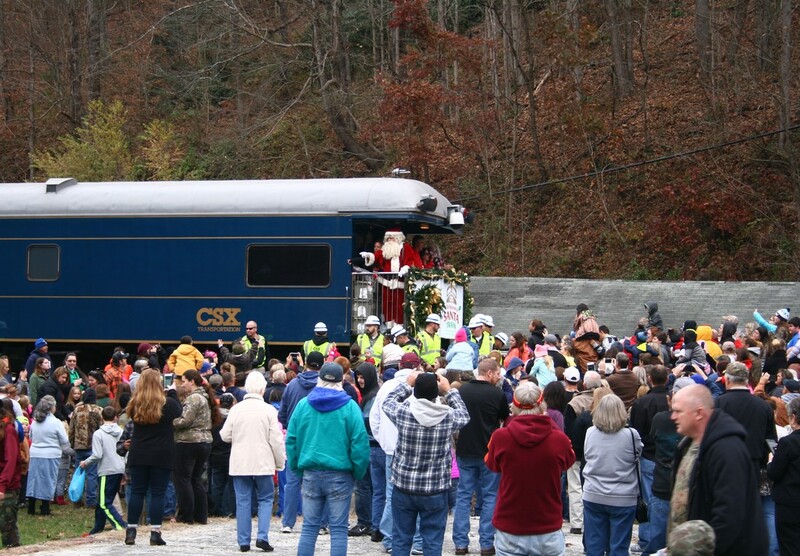 The #800 is no stranger to the Santa Train---it has graced the holiday run in previous years as well as other venues such as the South Branch Valley Railroad (Potomac Eagle) and commuter service for the Maryland DOT. It also served as power for American European Express runs between New York and Chicago. 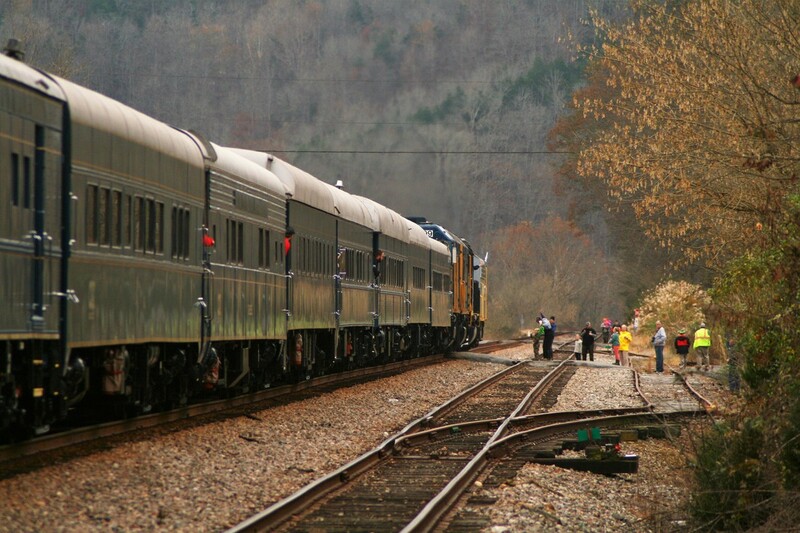 In 2014, it was among the lineup of locomotives to attend the “Streamliners Event” at Spencer, NC where it remained for three years until finding a new home at the Southern Appalachian Railway Museum in Oak Ridge, TN. Plans were in motion to restore the locomotive to its original Clinchfield colors/ #800 number and to use on the 75th annual Santa Train for 2017. The CSX Huntington Locomotive Shop repainted it to its 1948 appearance in time for the run. 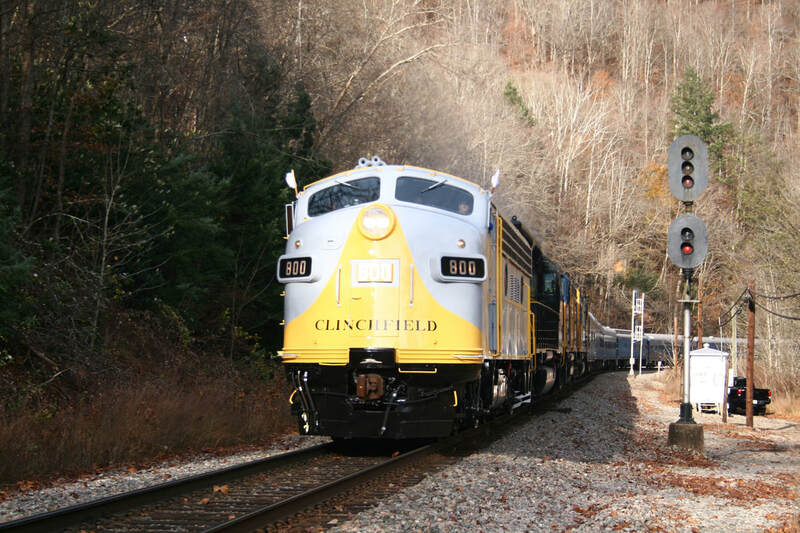 This locomotive has worn a number of paint schemes beginning with its original as delivered 1948 Clinchfield rendition. 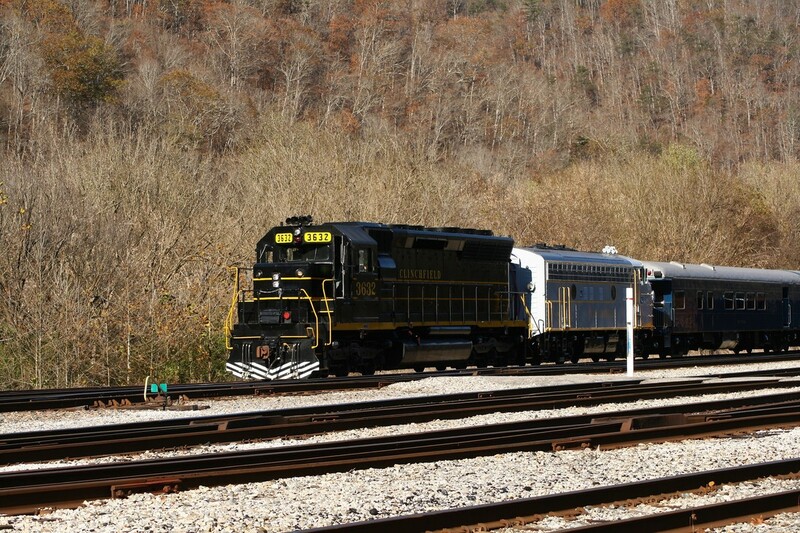 It has also displayed the Family Lines Scheme as well as two variations of CSX paint. Most recently it adorned C&O Railway livery as number #8016. “Clinchfield” SD45 #3632 was specially prepared for use on the 2017 Santa Train by the Southern Appalachian Railway Museum which it is included on its roster of locomotives. 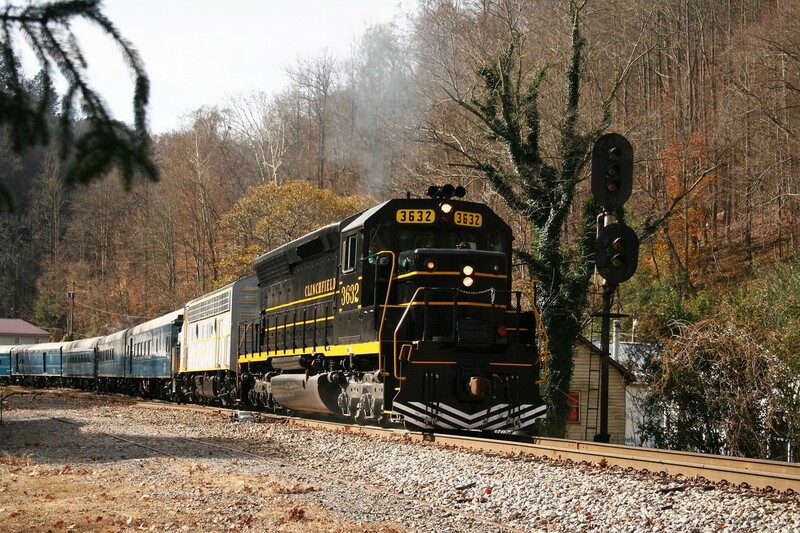 The “fictional” 3632 number is a continuation of SD45s that once occupied the Clinchfield roster. 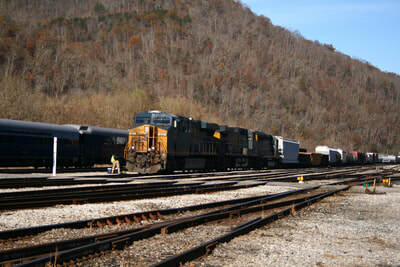 The black schemes used by the Seaboard Coast Line and the Clinchfield are similar. Inasmuch, the SARM was able to “convert” the locomotive from SCL #2024 to CRR #3632 by means of magnetic decaling. 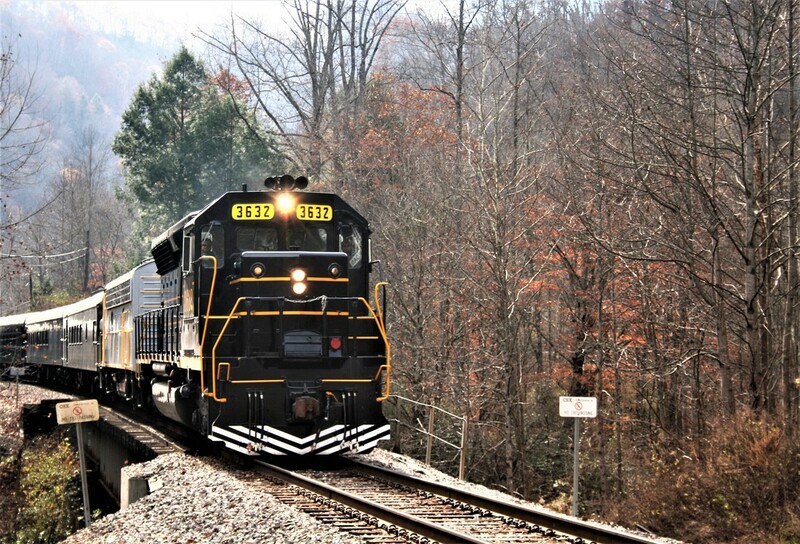 This locomotive, just as with the Clinchfield #800, has a history of multiple ownership and paint schemes. 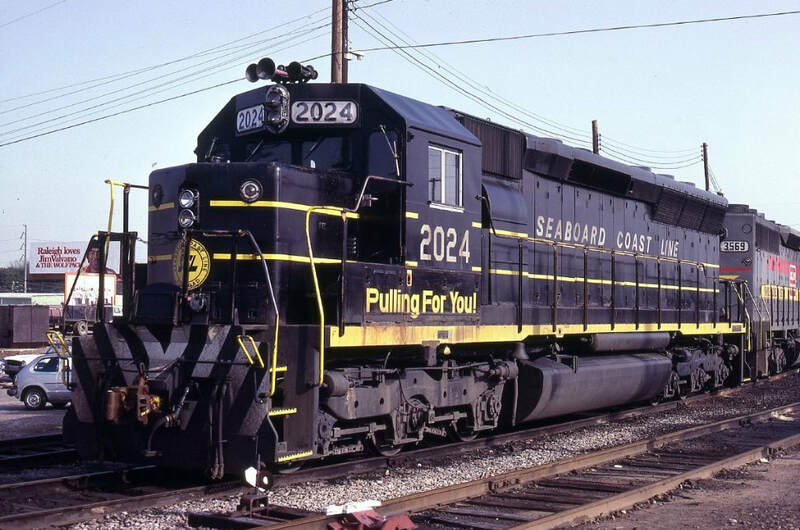 It was delivered to the Seaboard Coast Line in 1971 and remained on the active roster through both the Family Lines and Seaboard System era. 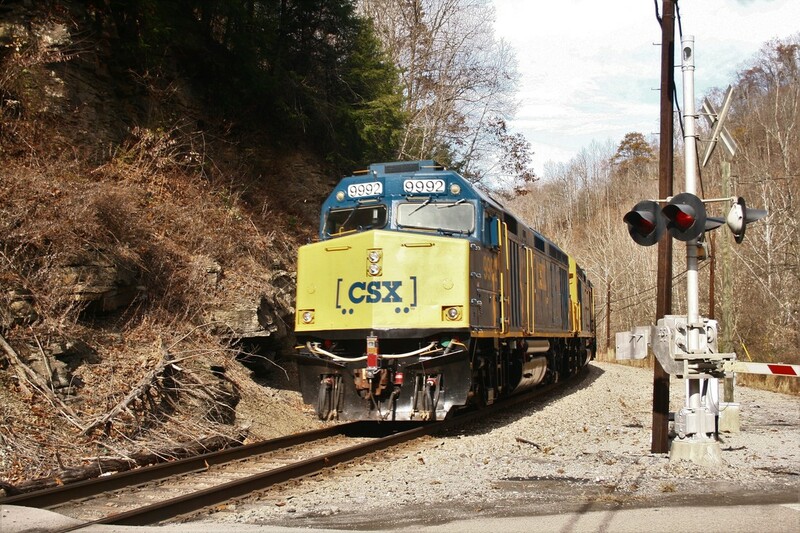 With the formation of CSX, the locomotive was renumbered to #8924 in 1986 but its time was brief on the roster. It was then sold to VMV and shortly thereafter, sold again to Montana Rail Link all the while retaining the #8924 number. It was then transferred as IMRL #8924 and subsequently returned to MRL. In 2007, it was sold as Northern Illinois & Wisconsin Railway #8924. It yet again changed ownership becoming VILX #8924. Residing at what is now a permanent home, it is a fully restored SD45 among the collection of locomotives at the Southern Appalachian Railway Museum. 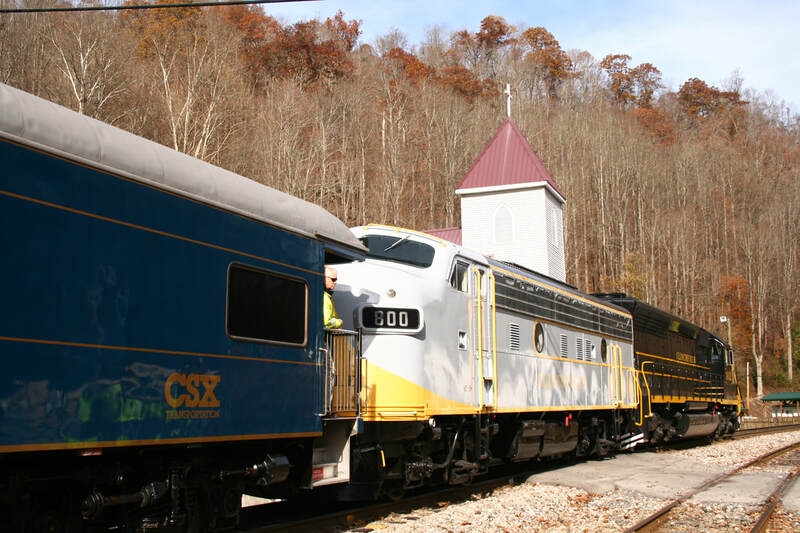 Both the CSX Huntington Shops and the Southern Appalachian Railway Museum did exceptional work with preparing these locomotives for the 75th annual Santa Train. 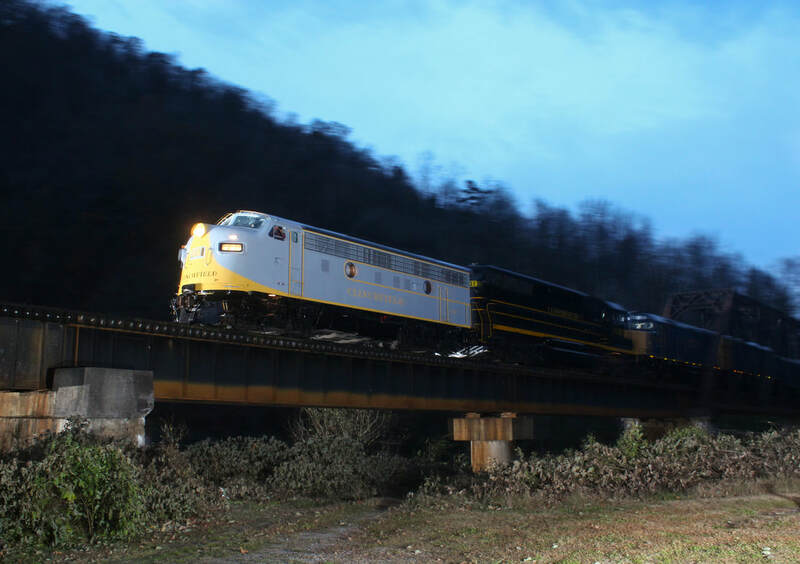 On Friday, November 17, the train continued on its deadhead movement from Jacksonville over the former Clinchfield Railroad bound for Shelbiana, KY from which it would depart southbound Saturday morning as the Santa Train. 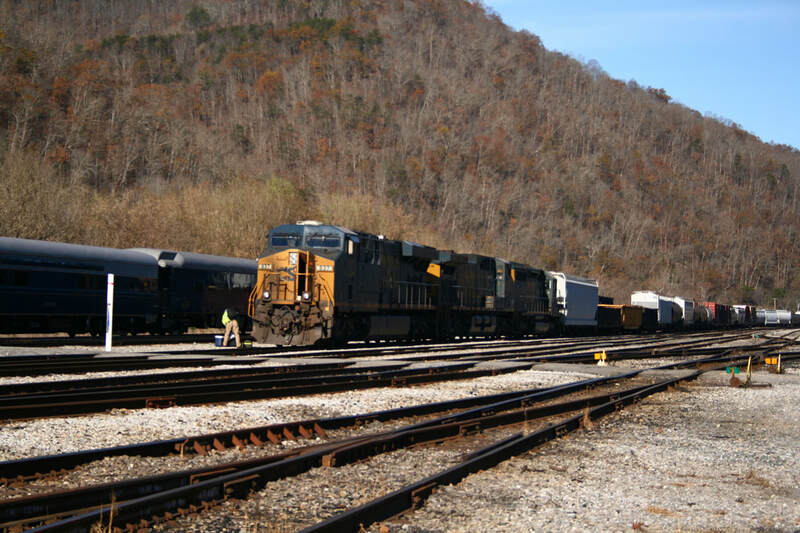 Leading the deadhead run was the Clinchfield SD45 #3236 with the #800 second out. The two CSX F40PH-2s, #9999 and #9992, trailed at the rear of the train. My son Matt, his friend Drew Faulk, his father David, and I embarked on the two day outing to catch this move and stay overnight for the Santa Train on Saturday. Our trip began early on Friday with the hope of intercepting the train at Dante based on the time it would take to traverse the route. Little did we know that the train was stopping at selected points for official photo ops and our arrival at Dante resulted in a nearly two hour wait for its passage. So we passed the time exploring and were greeted by several dogs happy to receive attention from the visitors. 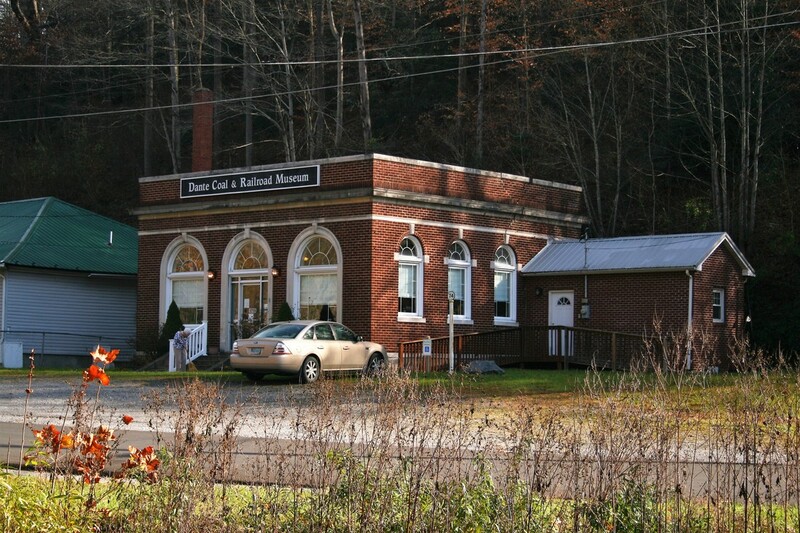 With time to spare, we wandered about and made it a point to visit both the Dante post office and the Dante Coal and History Museum where were treated to some genuine Appalachian kindness. Conversations with the postmaster and the museum curator were fascinating as both spoke about the area history and with an exuberant pride in their voices. The lady at the museum brewed a pot of coffee offering us a cup which was especially appreciated on a chilly November morning. If in the area, this a recommended stop--it is a small museum in size but large in its display of archival photographs, books, and other paraphernalia. 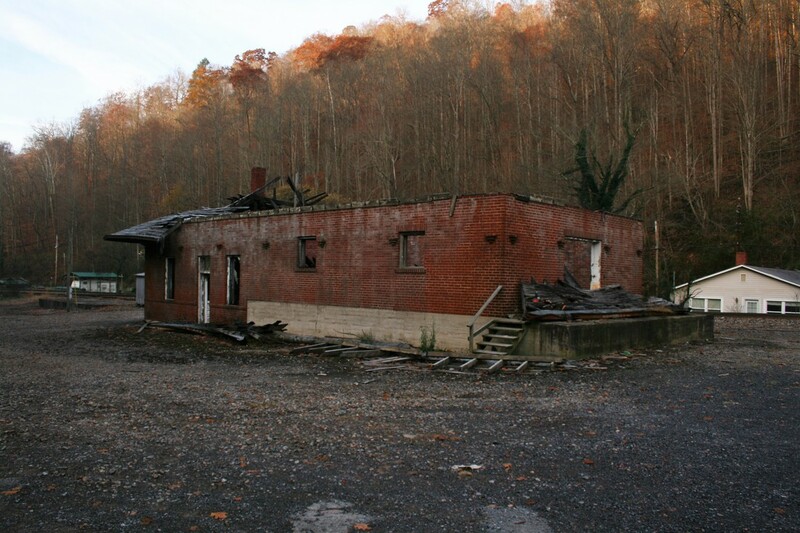 Among the first sights that caught our attention was the dilapidated condition of the Dante depot. When we were here in 2015, its condition was bad but the roof still intact. The roof was now gone assumed to be from a collapse but a local resident spoke with my son Matt and told him it was dismantled because of the asbestos present in the shingles. 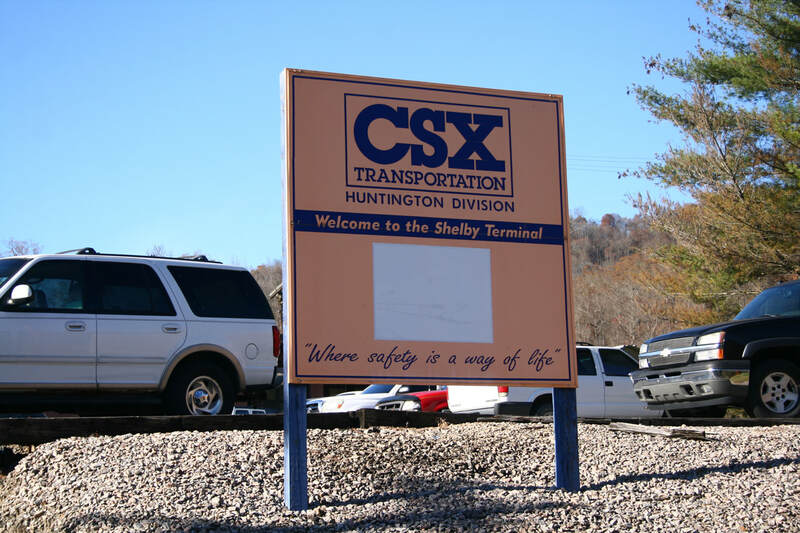 He further stated that CSX would prefer to completely demolish it but there is a plan and hope that it can be restored. Here's wishing that proves to be successful. Finally, we heard the sound of a horn south of Dante as it echoed through the valley. 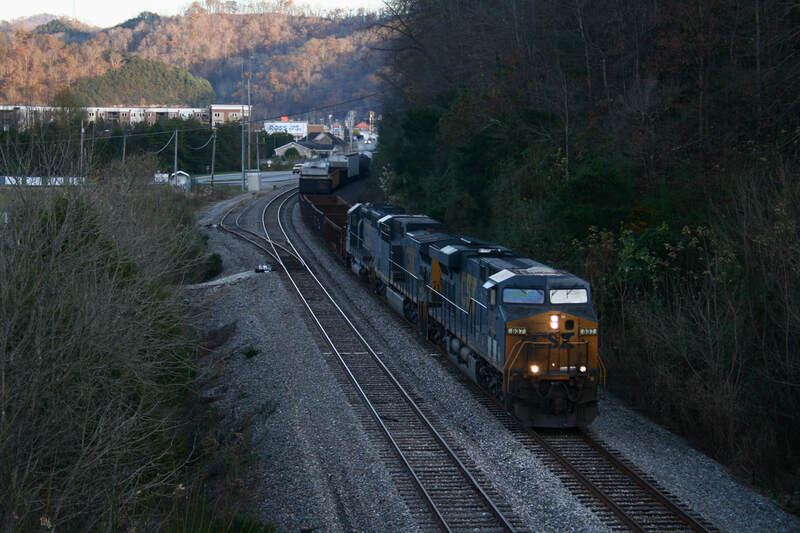 The deadhead move arrived and paused at the famous Clinchfield Railroad landmark at Dante, the Union Baptist Church. A flock of people accompanied the train to photograph it along the route in a choreographed event that was intentionally kept low key. 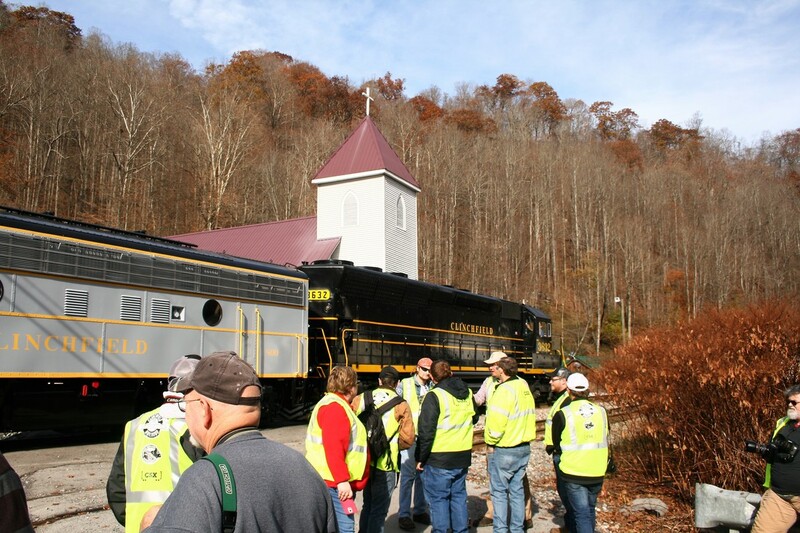 Comprising the group were representatives from CSX, the Southern Appalachian Railway Museum, and Trains Magazine as well as others. Very few were on hand at Dante outside of this group and ourselves to witness the passing. It would be a dramatically different scene here twenty-four hours later. North of Dante, we had hoped to catch the train as it emerged from the tunnel at Trammel but we just missed it. 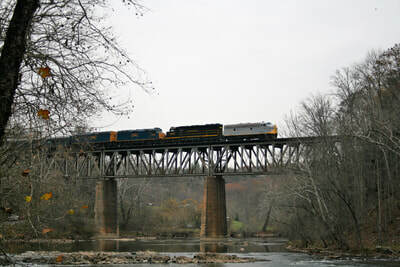 So we continued along VA State Route 63 and crossed a bridge that took us to the railroad just north of McClure. 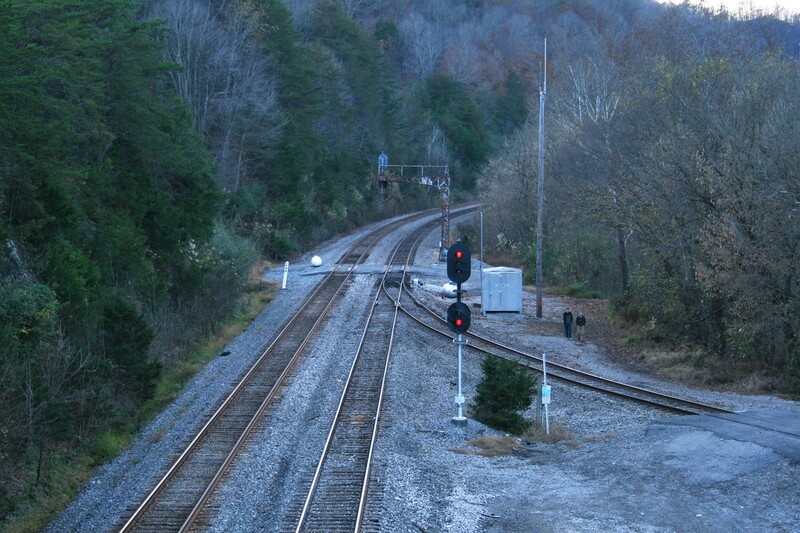 A short walk around the bend is the Caney signal and the junction of the Fremont Branch recently filed for abandonment by CSX. There was not enough time to set up there so we settled for the grade crossing shot instead. 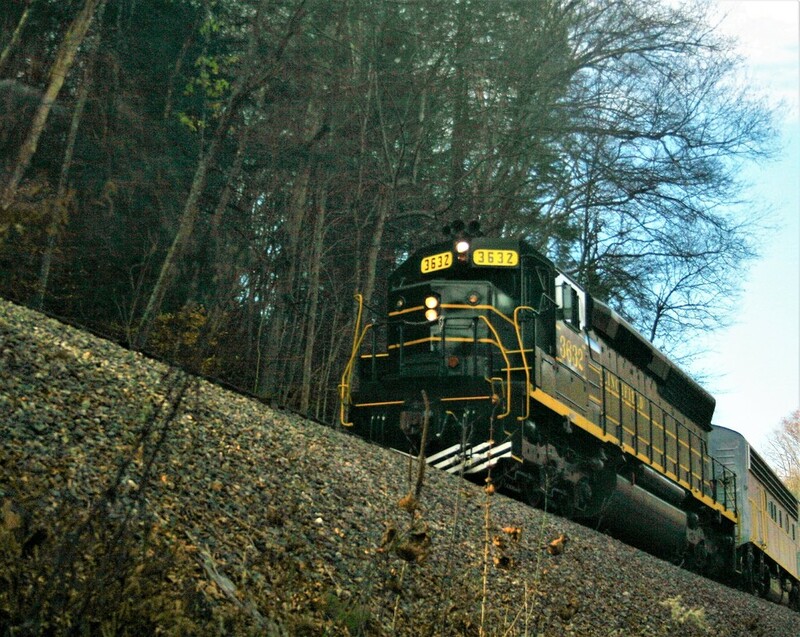 Railfanning the Clinchfield is an adventurous task and it behooves one to be familiar with the topography. 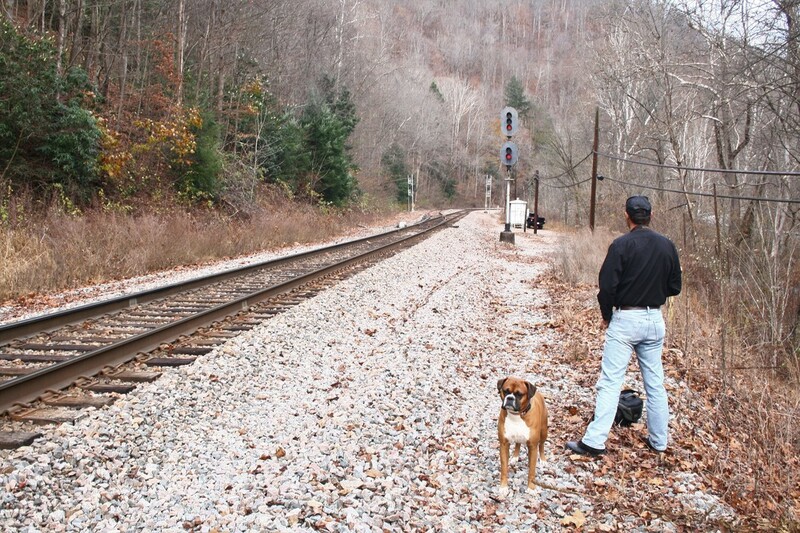 Veteran railfans and photographers of the region know the locations and the time required to reach them before a train arrives. Google Earth is an excellent general aid but it is of little help when one reaches a spot for a photo only to discover a hike up a steep embankment awaits. Whereas there are photo opportunities easily accessible, a number of dramatic vistas require serious leg work unless one opts to use a drone. Good physical condition and a comfortable pair of boots are a plus. 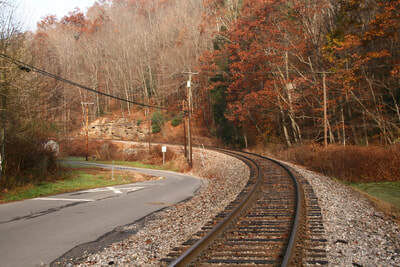 The town of Clinchco is located along the McClure River and the railroad sweeps through it on a curve spanning both the stream and VA Route 63. 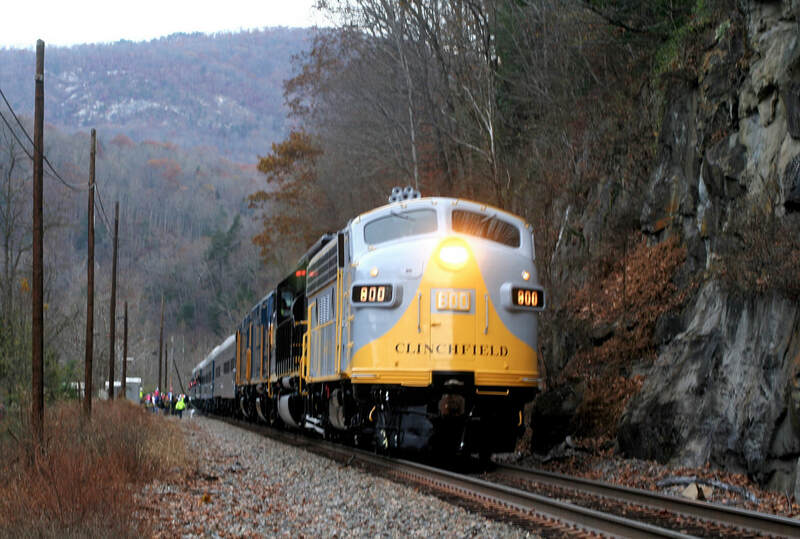 Its name is a purported melding of the Clinchfield Railroad and the Clinchfield Coal Company but there is not a historical consensus on this as fact. 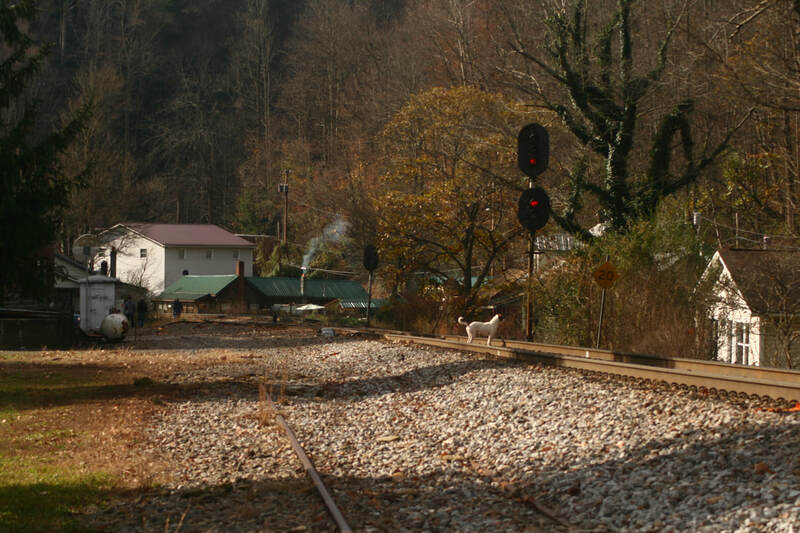 Regardless of the actual origin, Clinchco is another of the fabled small towns of lore along this mountain railroad. 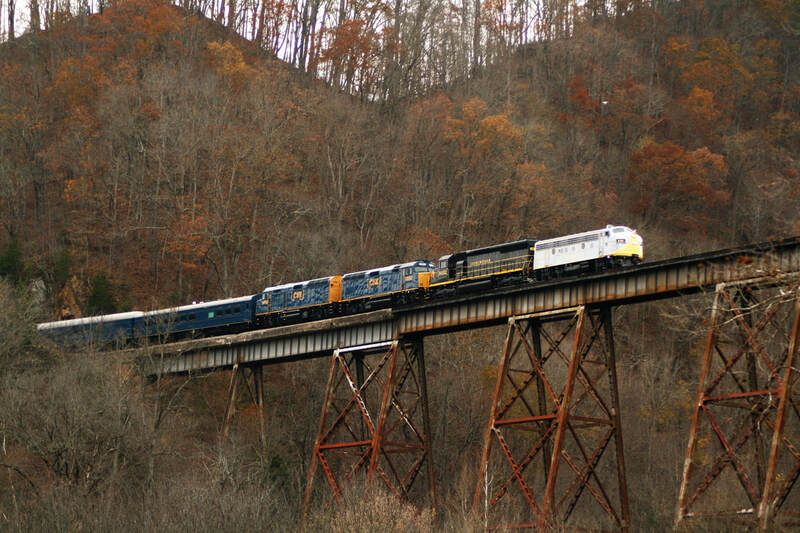 The highlight is the deck bridge and has been the setting of numerous photos for years. 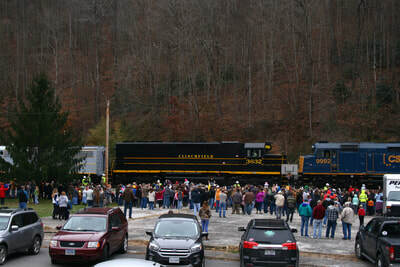 The deadhead move on Friday and the Santa Train on Saturday increased that number substantially. 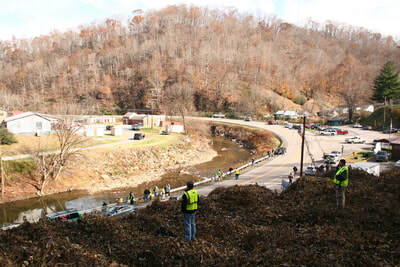 At the Clinchco stop, a large group gathered for the photo op of the deadhead run. Most were the people who were affiliated with the move as previously mentioned. But it was also apparent the numbers were increasing from the general public as word spread about the train on this "secret" move. The stops were an average of fifteen minutes each which provided ample time for photographs from different perspectives although patience and maneuvering were necessary. From ground level here, the best angle--scenically and light wise-- was from the riverbank. We also climbed a hill mired with trip inducing kudzu for bridge level views. Another location that regretfully we did not stop was at Haysi--for either the northbound deadhead move or the Santa Train the following day. The deadhead move did not stop there and we also knew that it would be difficult to secure a photo spot and especially so for the Santa Train. So Haysi was bypassed for both trains. 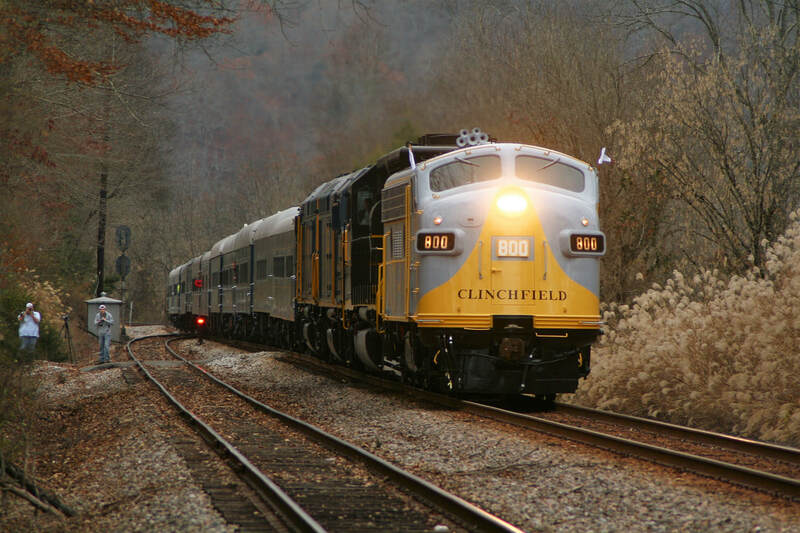 A future trip to the Clinchfield will include both it and Trammel regardless of what type of trains can be photographed at those two locations. The photo location that sat atop the bucket list on this move was the bridge spanning the gorge at Pool Point across the Kentucky state line. It is among the famous locations on the Clinchfield and the number of spectacular photographs taken here is uncounted. There are various angles here and one will have earned his keep from the camera because it involves a hike down--then back up--- a steep mountain slope with precipitous drop offs. 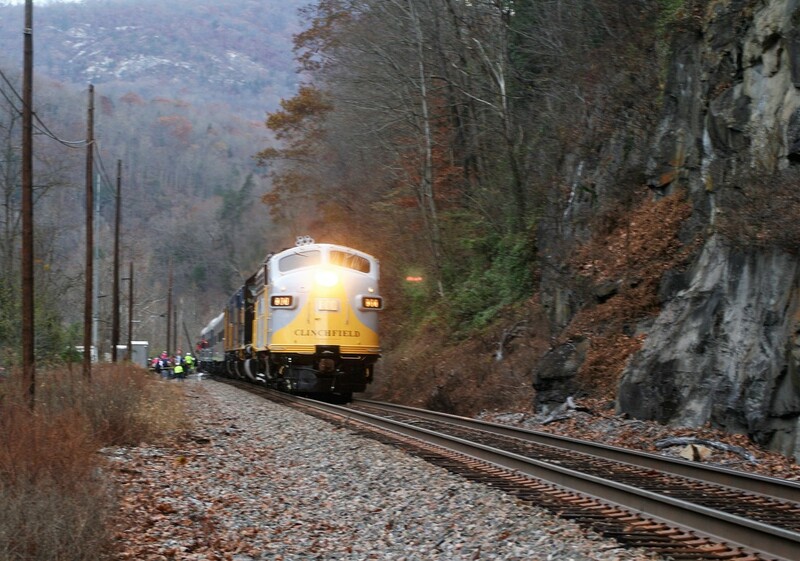 Out of view in the photos on this page is a tunnel that the train is facing. Photographers with a dedicated and adventurous soul have crossed the gorge to capture that angle at risk. With drones becoming ever more popular, using one here would be the best--and safest--means to capture alternate scenes. After departing Pool Point, we continued north through Elkhorn City---in hindsight, sorry that no stop occurred here---and crossed over the Russell Fork of Big Sandy River near the community of Marrowbone. 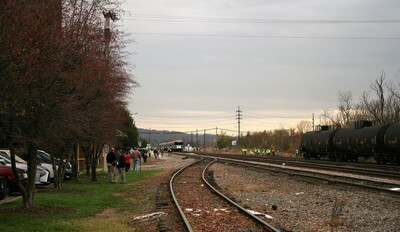 Several other photographers were at this location as the northbound deadhead move approached. 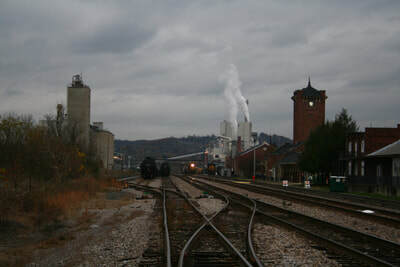 A few miles ahead lay the town of Shelbiana and the Shelby Yard and terminal. 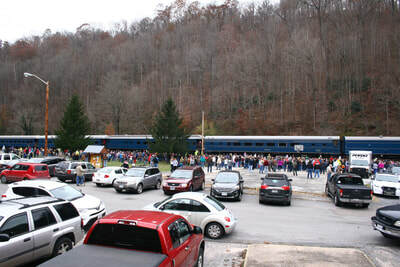 The northbound deadhead move terminated here and on the following morning, would be christened as the Santa Train as it embarks on its southbound holiday journey to Kingsport, TN. 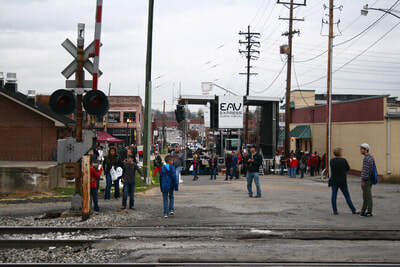 A large gathering was present at the arrival of the deadhead move at Shelby Yard. The group consisting of Southern Appalachian Railway Museum members and Trains Magazine photographers were on hand to record the end of the run. Random railfans (including us) were scattered about as were a number of CSX employees. All could not have asked for a better November afternoon to witness and photograph the event. 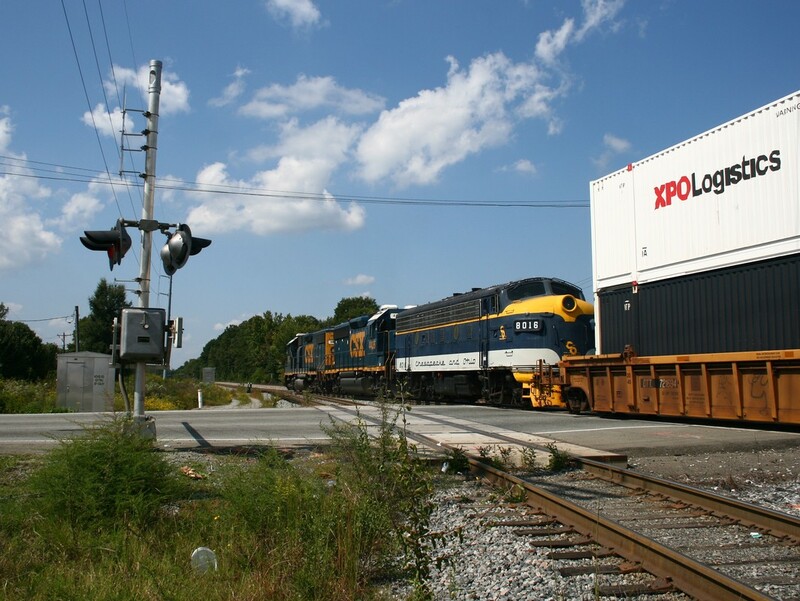 In the CSX scope of operations, Shelby Yard is a division and crew change point. It is the border between the Big Sandy and Kingsport Subdivisions--operationally, the divider of the former C&O and Clinchfield lines albeit a short section of C&O from here to Elkhorn City is included in the Kingsport Sub. Shelby Yard itself is a junction point--it is here that the CSX SV&C Sub diverges from the Big Sandy Sub. 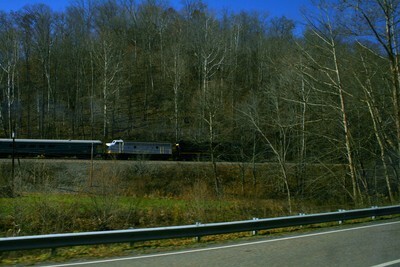 Although outside the scope of the Santa Train, included are a few images taken on the former C&O (CSX Big Sandy Sub) around the Pikeville area. We left Shelbiana and moved north to Pikeville for an afternoon meal. While there, we took time to look around and used the opportunity to capture a few images. A bonus was the passing of train Q692 and though not in an optimal location to photograph it (no sun), we shot it nevertheless. It may be an accurate assessment to say that this running of the Santa Train may go down as the most anticipated and attended one in its 75 year history. Another year that is often referenced is the 1992 train that featured the UP 4-6-6-4 Challenger disguised as a Clinchfield version of the locomotive type. But one must remember that this era predated the mass audience of social media and preponderance of digital photography so it was likely on a smaller scale. The big day began with a 5AM awakening and a 30 mile drive from the motel at Norton, VA to Elkhorn City. 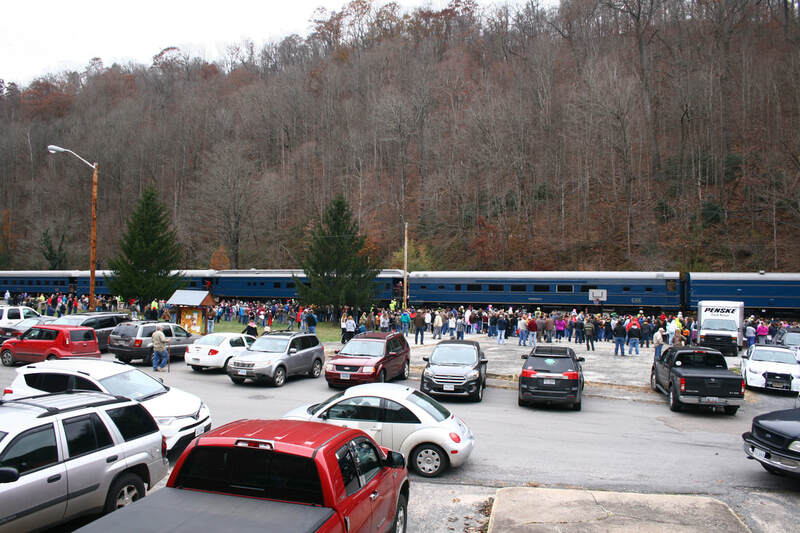 By the time we arrived, a large crowd was already in place awaiting the Santa Train. Different this day were two notable changes--the Clinchfield #800 would be the lead locomotive and there would be considerably more people along the route with more traffic on the roads. 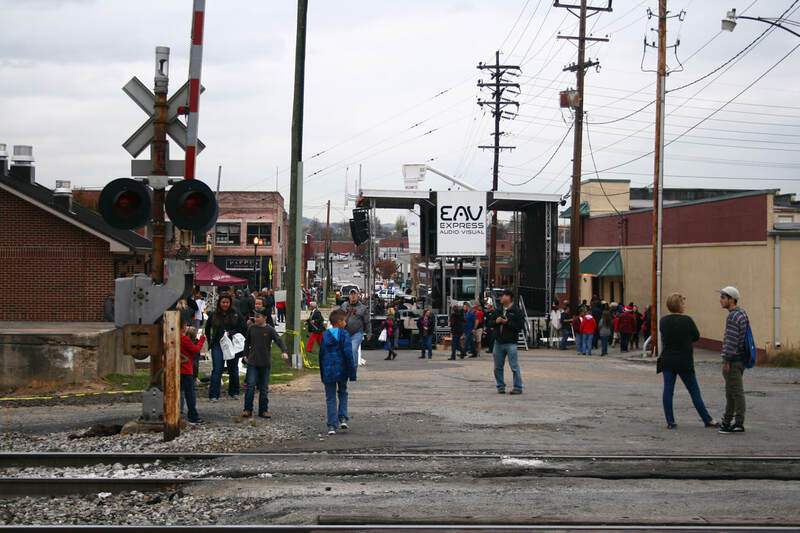 Elkhorn City is the third stop for the Santa Train--preceded by the origination point at Shelby Yard and Marrowbone. Fewer photographs have been taken at the early stops along the route because it is still dark. As railroad photography has exploded in popularity, portable standing flash bulbs are now common for use to photograph moving trains during the night hours. 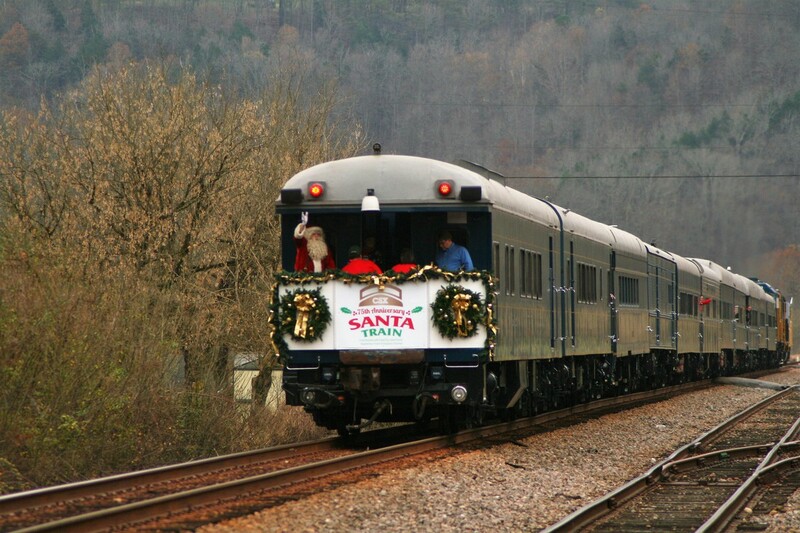 As a result, there will be more images from the first few stops on future Santa Trains. In our moment at Elkhorn City, my son Matt was the only one of us four to capture a good image because of the darkness. He was able to time his shutter with portable flash lights that other photographers had installed. Once the stop was complete here, a mass armada of traffic filled Kentucky State Route 80 for the trek south. The section of road between Elkhorn City and Haysi, VA is the most tortuous on the route--defined with crooked turns and steep grades. 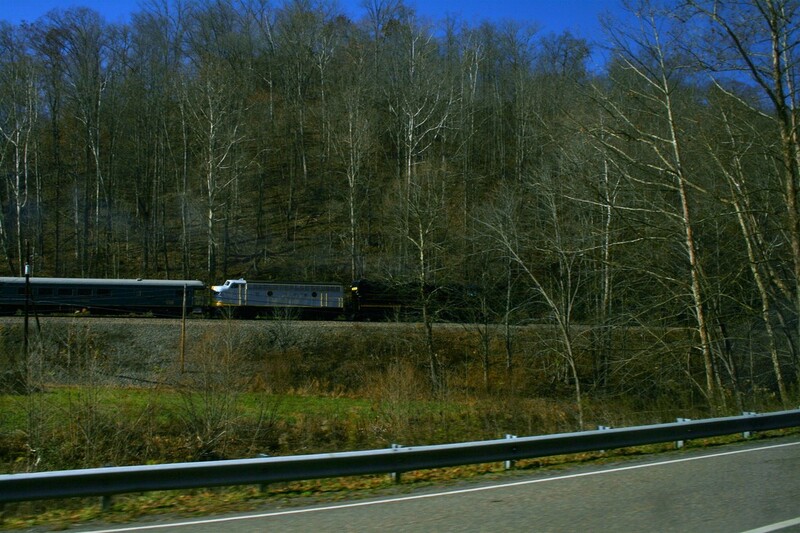 The trip south was further slowed by the traffic comprised of people such as we--chasing the train. We bypassed Pool Point and headed for the next stop--the first in Virginia---at Toms Bottom. Both Matt and his friend Drew were intending a panoramic shot from high above at Toms Bottom. We arrived before the train but the hike involved would have taken too long to ascend the mountain overlooking the bridge and stream here. There were a few photographers that achieved that shot but they planned it in advance to allow time to reach the heights. Even if we had arrived in sufficient time, I would have settled for what we were able to photograph. My aging legs, once conditioned to climbing the mountains of West Virginia in youth, would have complained bitterly at such an attempt now. Continuing south, we forsook the stop at Haysi assuming that the location there would already be saturated with not only photographers but the crowd for the actual Santa Train stop as well. As we arrived at Clincho, a huge crowd occupied the town temporarily increasing its population immensely. There was no visible area remaining which to park. We were not truly disappointed here as we had spent time here the day before during the deadhead move. ​Paralleling the railroad and McClure River south the railroad passed through a number of tunnels. Virtually all are difficult access with no road on the opposite bank. A determined soul would be required to wade across the river and climb its opposite bank for a photo opportunity. Eventually, we found a crossing with a tunnel but so had a group of others. My photo at what is Goff Tunnel at Steinman was ruined at the last moment by an extending arm and head obstructing the shot. Again, Matt to the rescue as he found a clearing and took the clean shot pictured at left. 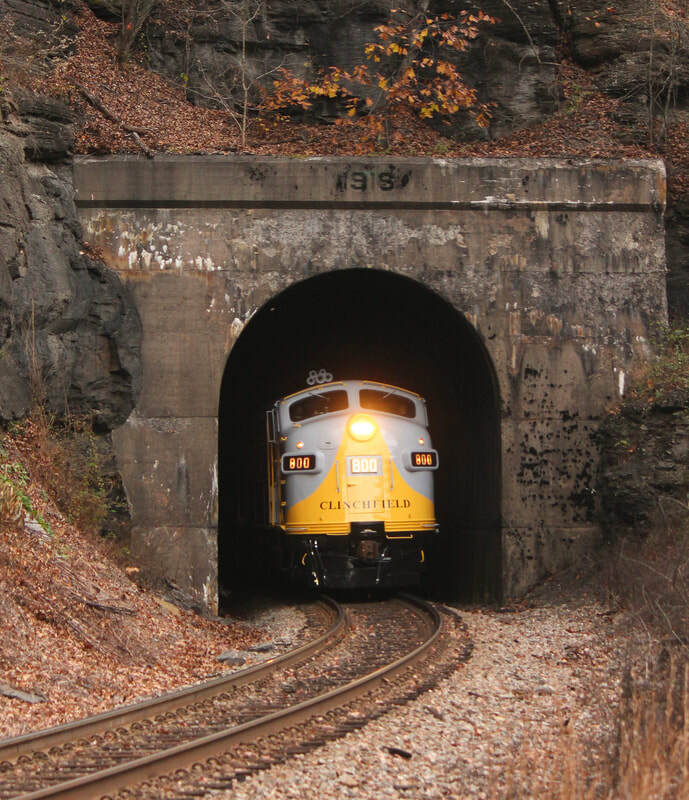 For those keeping count, Goff Tunnel is one of 54 located on the length of the Clinchfield. 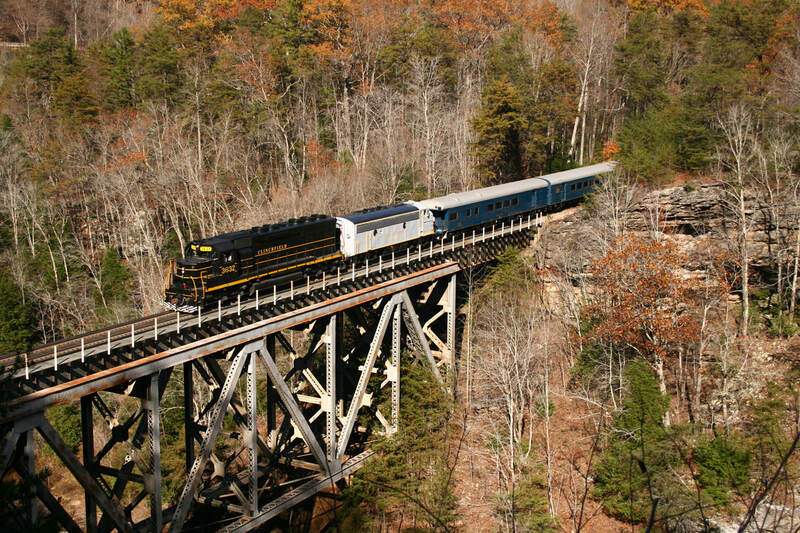 We were tempted to stop for the overhead bridge shot at Fremont but opted to continue a short distance to Caney Fork Junction. We were at this location the day before but with the southbound Santa Train, the signal at this spot could be incorporated into the shot. We lucked out here in regards to a photo spot--only one person was here. Several people arrived on the scene afterward to catch the train departing the Fremont stop but we had fortunately staked out a piece of real estate. In what is easily one of my best shots of the trip, the Santa Train passes the northbound signal at Caney Junction between Fremont and McClure. The "extra" white flags add a touch to the already resplendent locomotive. Image Dan Robie 2017. A note about this trip---it was for the young men. Matt and Drew had planned this outing in advance studying locations both from Google Earth and photographs they had seen. Neither I nor Drew's father David wished to deviate from their plans-- where they wished to stop was fine with us. From my perspective, I was happy to be invited and witness this historical event. Any photographs were simply a bonus. 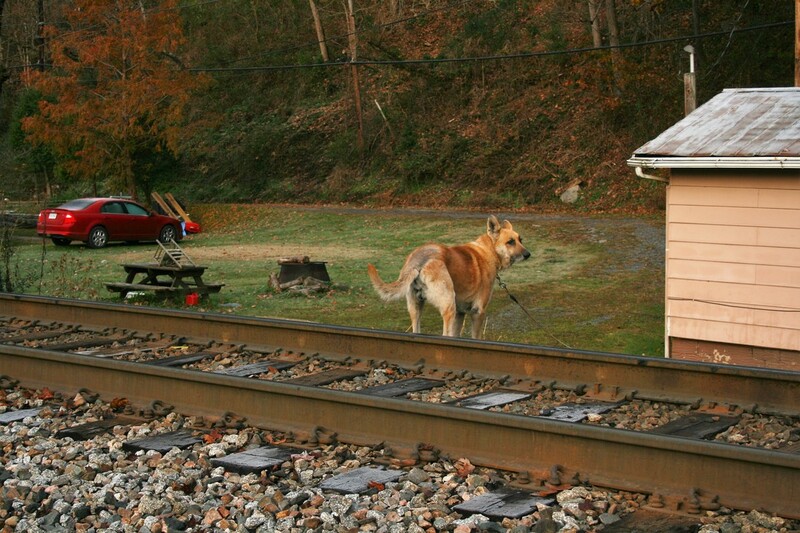 We knew that Dante would be a major stop for most simply because it is a foremost location on the Clinchfield. No attempt was made to find a spot at one of the signature photo spots on the railroad--the Union Baptist Church in Dante. 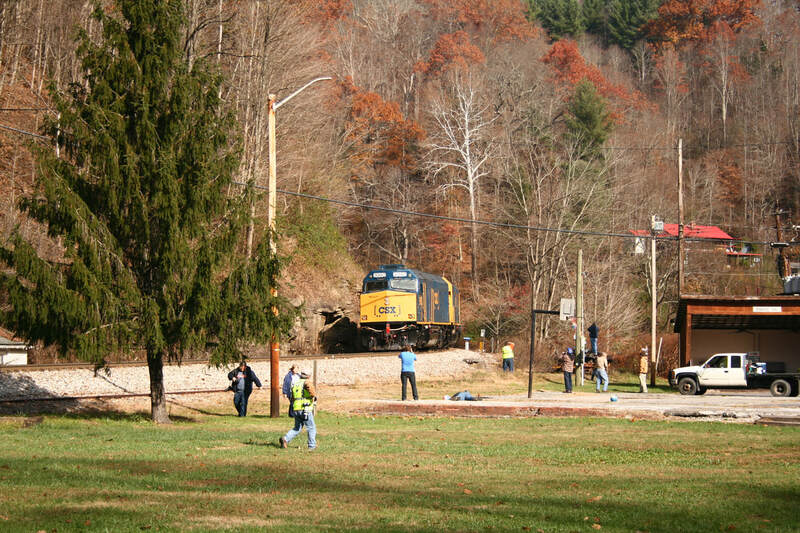 As it came to be known, few people were able to photograph a clean shot of the train beside the church. It was learned afterward that an individual "sabotaged" the scene with his presence at the church creating an ire that reverberated throughout social media. Needless to say, it was most unfortunate. Heritage locomotives in scenic settings aside, these four photos above and below at Dante are the essence of the Santa Train and its existence. In a region that has endured more than its share of hardships, this is Christmas for some. 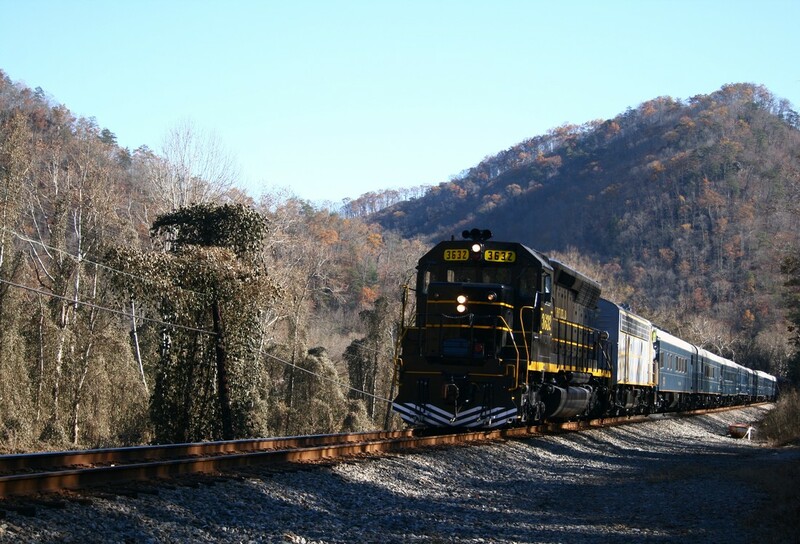 Young children learned that Santa Claus didn't come by reindeer and sleigh but by train through the Appalachian Mountains. Mankind is less than perfect but acts such as this train symbolizing compassion and generosity exemplify humanity at its best. Since we passed on attempting to see and photograph the train at the church, this was a great opportunity to focus on a stop itself---something we had yet to do. To witness this is to warm the heart. The crowd, the atmosphere, and especially the children, beckons with kindred spirit and leaves one who absorbs the moment with watery eyes. In search of another train with signal shot, we spotted a wide spot in the road south of the Dante Yard. Several people were already established waiting for the departure from Dante. A few had forded the stream to catch a direct shot of the train passing the signal location known as Philips. Matt and Drew crossed to the opposite bank but I opted to remain on the road bank for a side view. ​CSX exhibited a relaxed stance about railfans and photographers along the right of way during the Santa Train run---at least from our observations. Company employees readily mixed with the crowds and photographers at lighter populated locations. 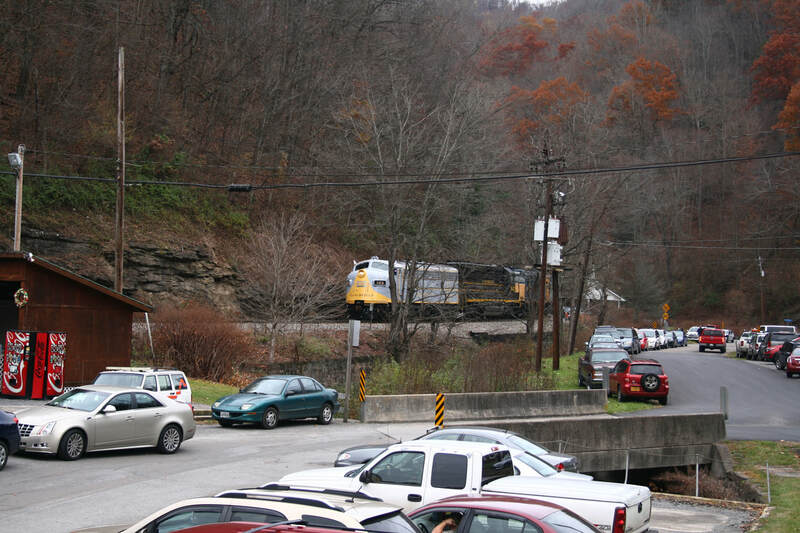 Obviously, this was no ordinary train and CSX---to its credit--realized the tremendous interest it would generate for the public. I heard no negative reports of a CSX official discouraging photographers or of "running people off" as long as they remained out of harm's way. The worst traffic experienced during the day was the region between Dante and St. Paul. Another planned stop was at Boody but because of how slow we were moving, the train had passed by the time we arrived. The Santa Train was at its St. Paul stop by the time we emerged from the snarl so the decision was made to continue south to Dungannon. Our previous turtle pace escalated to that of the hare which enabled us to reach Dungannon with some time to spare. Once at Dungannon, the four of us split into two groups. Drew and his father opted for high ground while Matt and I stayed below to attempt to create a theme shot. If the two of us had it to do again, we would make an alternate choice. Of all the stops, Dungannon was the only one smitten by a sense of disappointment. My photograph was obscured by another photographer moving at the last second. Matt's shot at left is good--but the traffic pacing the train in modern cars ruined the theme. Of course we knew that capturing the store scene without traffic would require an absolute lucky instant. Finally, Matt had also attempted to record video at this spot but was interrupted by a drone flying at ground level moving through the frame. High on the list of locations to stop was the region near Starnes. We had been able to depart Dungannon ahead of the pack and searched the area for a good photo spot. 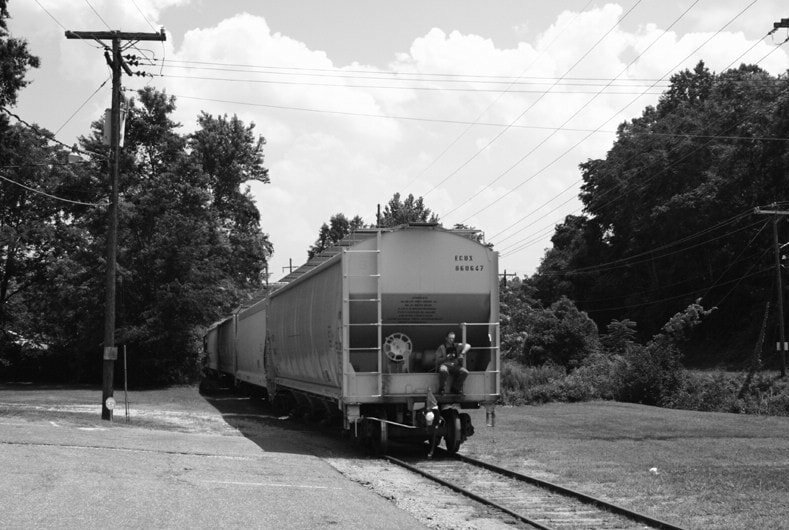 There were people scattered randomly along the railroad already set up for their opportunities and eventually, we found a private driveway leading to the Starnes siding and north end signal. 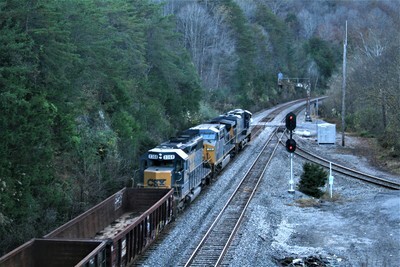 Moving southbound past the signal and passing siding at Starnes. The Clinchfield is a valley railroad through this region with longer tangents through a pastoral setting. Image Dan Robie 2017. 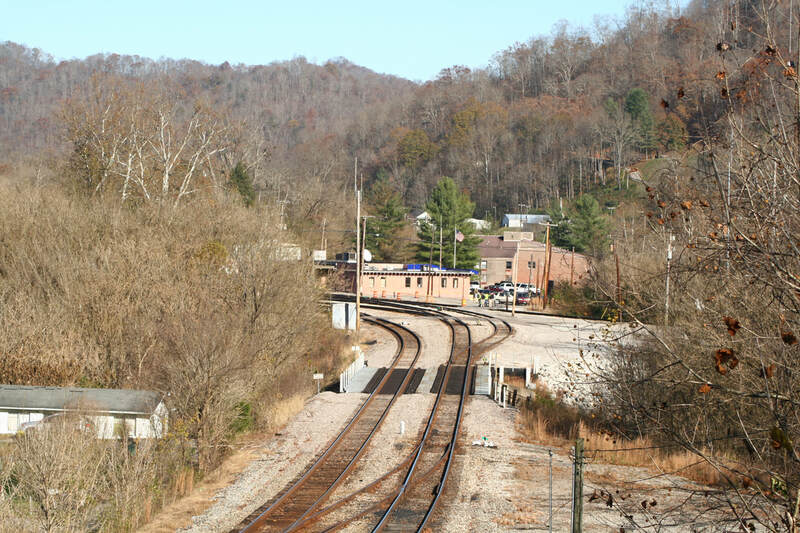 The topography traversed by the former Clinchfield transforms south of St. Paul from mountains to the pastoral valley of the Clinch River. 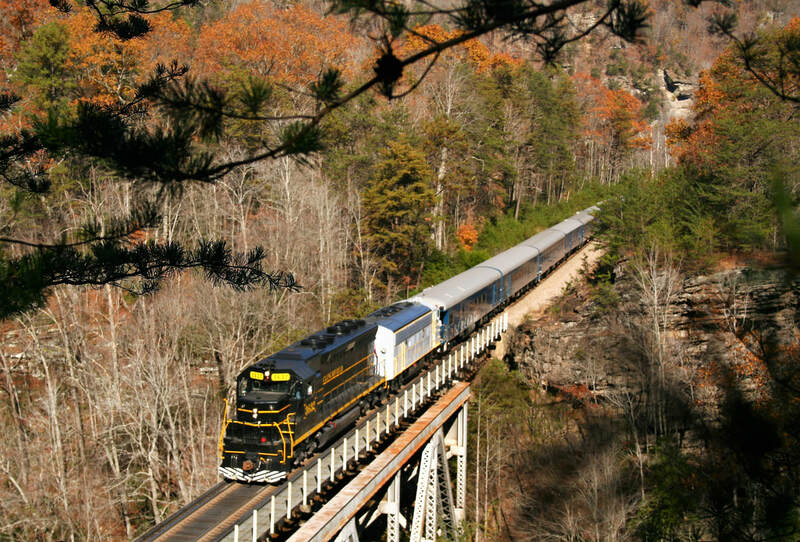 The mountains here remain elevated but the railroad runs below in the valley itself in a setting that beholds its unique beauty. There are numerous locations for photo opportunities here on relatively level ground and in proximity of the highway extending to the area of Fort Blackmore. Fort Blackmore is among my favorite locations along the railroad and one that I appreciated immensely after the visit in 2015. There was no mention of stopping there this year although as we approached, it was briefly considered. 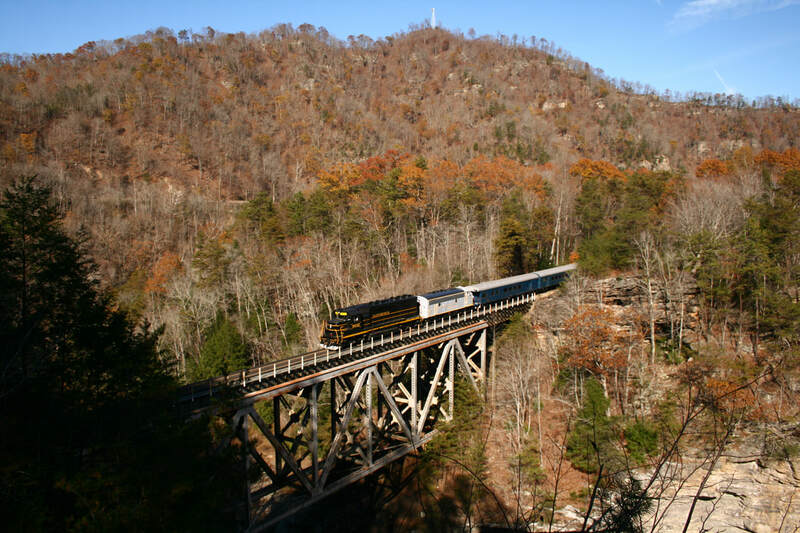 Instead, the thought was to continue onward to what is arguably the most popular photographic location on the Clinchfield----the famed Copper Creek viaduct at Speers Ferry. Between Fort Blackmore and Speers Ferry one can see one of the many engineering marvels of the Clinchfield Railroad construction. 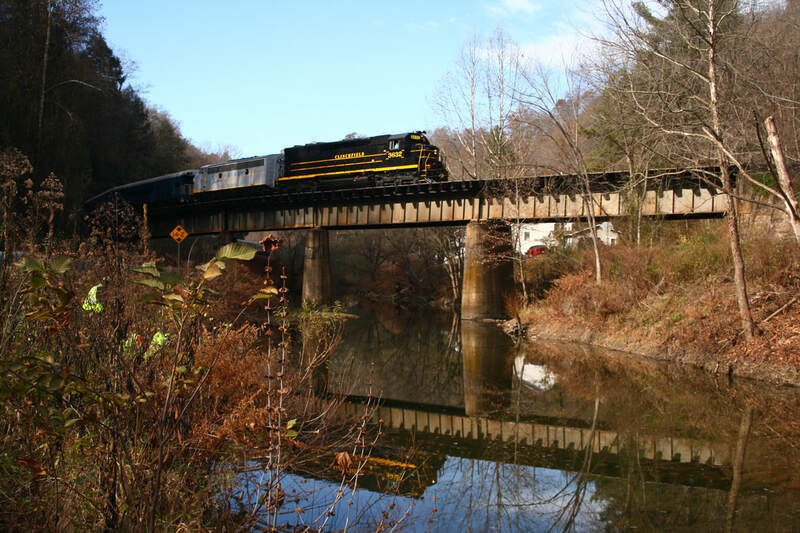 The railroad crosses the Clinch River to its east bank and begins a long steady ascent southbound along the ridge that culminates at the impressive steel viaduct at Copper Creek. It is readily visible in late autumn and winter once the trees are devoid of leaves. Once we arrived at Speers Ferry, a large group of people were on hand as expected yet not the number anticipated. The area facing the Coppers Creek viaduct from US Hwy 58 provides the panoramic view of the structure but as so, is farther away. Nevertheless, there was nary a place to park so we chanced the area from the opposite side looking directly up at the span. Surprisingly, there was still access here to park and secure an unobstructed view. When the Santa Train arrived, it crossed the viaduct at a snail pace enabling opportunity to eat up megabytes quickly on the camera memory cards. The only negative here was beyond our control----fading light intensified by overcast skies. On the outskirts of Kingsport, we detoured to another frequented photo spot which is the bridge spanning the Holston River. By this time, though, the light was bad and our photos taken there suffered from the poor conditions. In hindsight, it would have been better to forsake this stop and head directly for Kingsport instead. The light would have been better there to catch the train at its end point. As it was, we did go to Kingsport afterward but the festivity of the stop had concluded with the Clinchfield locomotives uncoupled from the train and moved to Carter Yard. 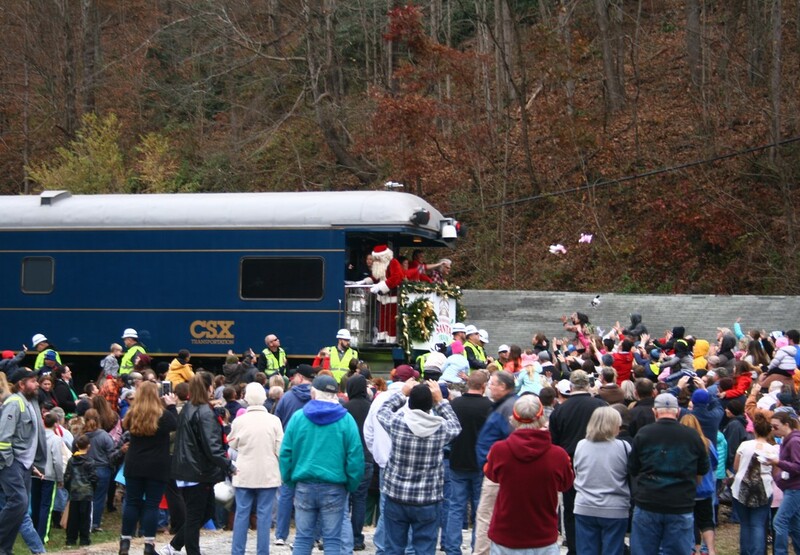 With the 75th running of the Santa Train complete, immediate reflection is for what a resounding success it was. The extraordinary efforts of CSX and the Southern Appalachian Railway Museum for the Clinchfield heritage power were appreciated by many. As always, the volunteers on the train, as they do each year, worked tirelessly with a genuine passion for what they do. There are other individuals involved in various aspects of the event that contributed their dedicated efforts as the sum of the collective success. Last but certainly not least, the participation by all the other sponsors not listed here for their respective contributions and efforts. It is a long standing tradition to invite a celebrity to ride on the train each year. The guest this year was country music star Ricky Skaggs, who like all before him, was touched by the experience. Ricky is visible in the photos above taken of the stop at Dante. 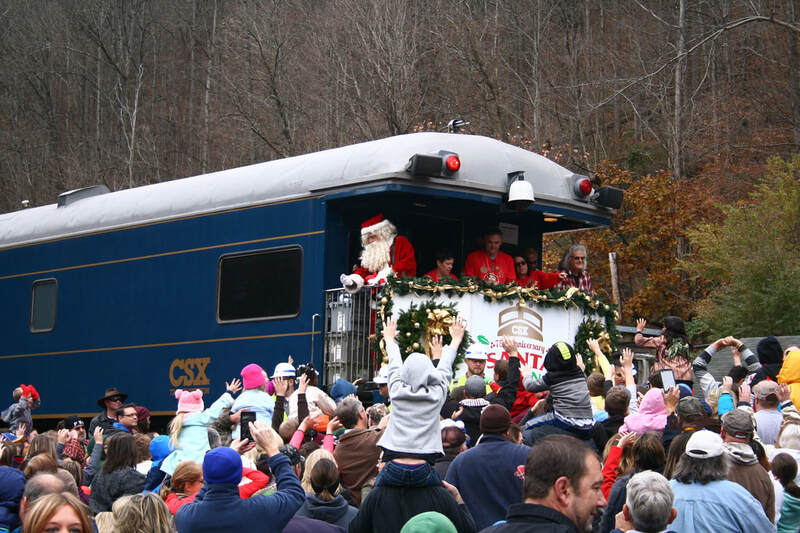 By the time this piece is published on the WVNC Rails web site, the 75th annual Santa Train will be ebbing from the collective conscience as it fades into a past event. Literally thousands of photos document the event ranging from the average--such as mine here--to the spectacular by excellent photographers posted to enumerable sites on the internet. It is an obviously well recorded event. This just might be my favorite planned rail experience ever partaken. Separating it from the memories and trackside outings in the distant past of railscapes long since vanished, it certainly is in recent times. All of the elements involved merged in perfect harmony--the locomotives, the picturesque setting, and last but not least, the meaning of the event itself. It is an unforgettable experience and best of all, the privilege of sharing it with my son.